In the fall of 1931 a unique birthday gift was delivered to the summer home of Grace Anne and John Forlong on Lake of the Woods. John’s gift to Grace Anne was an 85-foot mahogany yacht built by the renowned Ditchburn Boat Works of Gravenhurst, Ontario, whose story is one of the grandest tales of the lake. Scroll down for the complete story. The Grace Anne II offers not only a historical design, but also a historical tale that adds further character and depth to this floating work of art. The original Grace Anne, and her husband John Forlong, were the original owners of the Grace Anne II. The Forlong family's connection to Lake of the Woods began in 1893 when Grace Anne's father, Alexander MacDonald, built a summer home on the north shore of Coney Island. MacDonald was one of the wealthy westerners who had discovered the sweet tranquility of the lake in the late 19th century; and became determined to own a piece of the stunning summer paradise for himself. After his passing, MacDonald left his dream summer home to Grace Anne and John. While enjoying the pleasures of their new summer home, the Forlongs discovered a love for exploring the surrounding lake through leisurely boating. Family folklore has it that in 1913 John Forlong won a 52-foot cruiser in a poker game, and then re-christened his winnings, "Grace Anne". 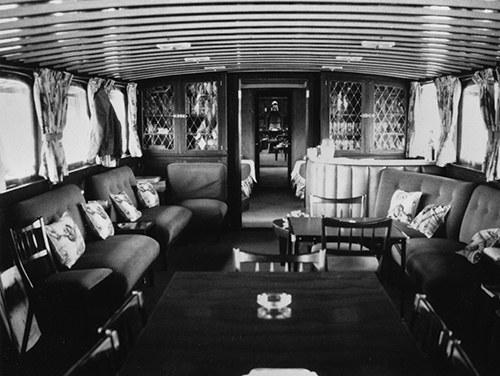 The Forlongs spent the next 18 years enjoying the boat, using it as a pleasure yacht, exploring the lake and entertaining their guests on board during the weekends. In 1930 John Forlong contacted Ditchburn Boat Works of Gravenhurst, Ontario, Canada, and commissioned the building of a second "Grace Anne" as a unique and elegant birthday gift for his wife. Christened "Grace Anne II", the 85-foot mahogany yacht was considered the finest craft to be introduced into Lake of the Woods. After a reported four and a half months of construction, at an estimated cost of $75,000, the Grace Anne II launched in Orillia, Ontario. The yacht was piloted through the Trent-Severn Waterway to Thunder Bay (then Port Arthur), and from there was transported by rail to Lake of the Woods. The Forlongs entertained many of their guests on afternoon and overnight cruises on the Grace Anne II. Each trip allowed the Forlong family and their guests a chance to enjoy the incredible scenery of the lake and all the outdoor entertainment opportunities the setting promoted. However, wartime gas rationing put a damper on the long leisurely cruises they had come to love. For the next five years the boat spent more time in the boathouse than exploring the waterways. In 1946, the boat was sold to Ralph Erwin, then owner of the Salisbury House restaurant chain. For the first couple of years, Erwin operated the Grace Anne II as a cruise ship under the name Adventures Unlimited, appealing mainly to hunters and fishermen. By 1947, Erwin was promoting cruises to large corporations as part of incentive bonus plans for employees. By 1950 the Grace Anne II was being operated as a private club, with seven shareholders each enjoying three weeks cruising time. The 3M Company of St. Paul, MN , USA, invested in the idea of the Grace Anne II as a venue for business entertainment and purchased shares in the boat. By 1954, the Granules Department of 3M had purchased all shares and became the sole owner of the Grace Anne II. A few years later the yacht was turned over to the parent company under the name Salisbury Cruises Ltd. It continued operations over the next 40 years serving the marketing needs of a growing number of 3M service and product divisions. During their ownership 3M made strong efforts to maintain and preserve the Grace Anne II and restore the original character of the yacht. In addition to preserving the boat, 3M focused on staff service-training in order to maintain the tradition of classical guest service, such as that found in successful, world-class facilities. In 1994, 3M repositioned and sold a number of internal services including the Grace Anne II and its related corporate assets. After this change, the Grace Anne II came under the leadership of former 3M managers Brad Doerksen and Ron Christie, and this permitted client expansion beyond 3M guests to include a number of additional new Fortune 500 client companies. Following the downturn of the hospitality industry after September 11, 2001, Morris Chia, through one of his companies, became the sole owner of the Grace Anne II, the 40+ acre island lodge, and other former assets of the 3M company for the operation. Through one of Morris' companies, experience in the travel industry was brought and the Grace Anne II business model was maintained, refined, and expanded to cater to Canadian and worldwide clientele. The product offering was also expanded to include complimentary offerings, including the private island lodge, branded "Turtle Bay Lodge", a one of a kind 38'Tug Yacht, and the original fully restored 1936 Greavette owned by Grace Anne's son, Duncan Forlong. Throughout its life and into the future the Grace Anne II represents the pinnacle of elegance in the Canadian wilderness. It offers a rare commodity of old-world luxury service complemented by modern amenities expected of the most discerning travelers in the world. If you are interested in a complete pictoral history of the Grace Anne II, the commemorative book, Grace Anne II, Lady of the Lake, copyright 2008, is available for sale in our giftware section.